The Fiji Labour party has called for the constitutional roadmap announced by the Prime Minister to be replaced by one that is truly independent and inclusive. FLP national council held its first meeting in three years at the Ba hotel yesterday. Leader Mahendra Chaudhry said the various steps announced by the government were determined without any consultations with political parties or civil society organizations. The party also feels that in order to have consultations and full participation of the people, all decrees and policies that impede freedom of assembly, association, expression and movement must be removed. Prime Minister, Commodore Voreqe Bainimarama had already told Fijivillage that people like Chaudhry should just take their views to the Constitution Commission. When earlier questioned by Fijivillage on Chaudhry's disagreement on the government's constitution consultation process, Commodore Bainimarama said that he cannot say much on the daily comments being made to the media by people like Chaudhry. Attorney General and Minister for Elections, Aiyaz Sayed-Khaiyum had also said that the government will ensure that there are wide consultations on the new constitution. He said it’s not just about getting the views of some politicians and NGOs but everyone will be consulted. 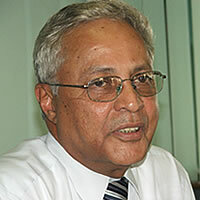 Meanwhile, Former senator Sachida Nand Sharma has been chosen as the Acting President for the Fiji Labour Party.